MSN Messenger is no more and is being renamed to windows live messenger. Main Features of Windows Live Messenger > Change of Messenger Skins > Real-time Emotions > Messenger Built Internal Windows Media Player 10 > Pause/Resumed File Transfers (File Blocked Extension Applied) > Detailed File Transfer (Download/Upload Speed) > Animated Display Pictures (.gif .jpg .png (File Support under Consideration)) > Mood Status > Faster Contact List Loading and scrolling > Public Profile and MSN Spaces Combined > More MSN Space features > New Hotmail and MSN Messenger Integration > Downloadable MSN Messenger on Mobile > News Updates according to Location > Top 10 MSN Music Radio > New Stylish Notifier Pop-up > Downloadable Skins for MSN (Contact Window & Conversation Window) > Complete Integration with Windows XP & Windows Vista > Offline Voice/Message Machine > Animated Buddy Icon Helper > Display Picture Ratings I was waiting for Offline messages & Pause/Resumed File Transfers features in MSN messneger. But only one problem is its size, 17Mb to download. So iam waiting for a final version to download else i will try to download after my exam. Do you want to try? Here is the link to download. Bill Gates announced the new Microsoft Internet-based projects: Windows Live and Office Live. 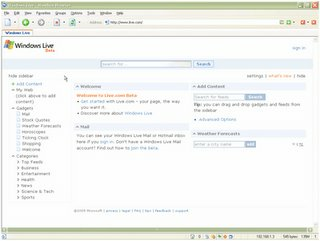 They are not the Internet version of Operating System and MS Office.Live is a set of Internet-based personal services, such as e-mail, blogging and instant messaging. It will be primarily supported by advertising. Office Live will come in both ad-based and subscription versions that augment the popular desktop productivity suite. Once Live.com is loaded, you will get a left sidebar and a content column. Overall, it is clean and ads free (currently). Live.com is powered by AJAX. The content box is movable by dragging & dropping it. In the sidebar, there are "My Web", "Gadgets", and "Categories". You may add your own content into "My Web". Under "Gadgets" are several Internet services such as webmail, stock quotes, weather, etc. There are preset site feeds in "Categories", which give you the latest updates of your favorite topics. Now Live.Com supports Firefox Browser. Iam using Yahoo Messenger Beta 7,0,0,249 . My problem is iam not getting any Offlines messages or Contact Add request since last two weeks. But this problem is only for my id(arunmvishnu@yahoo.com). All my friends getting offline messages or Contact Add request from the same messenger. I send a feed back(http://in.help.yahoo.com/help/in/mesg/twin/twin-28.html) to Yahoo. But I got only a "Thank You" Mail for sending that feed back. So if you know how to solve this problem please help me.